The Lucky Clovers 4-H Club recently participated in a community activity called Blessings in a Backpack. They unanimously voted on this project, which helps local children in the community who don’t receive enough food. Sometimes, their only meal is the food they get for lunch at school. Some of the foods they packed were fruit cups, juice boxes, popcorn, instant oatmeal, and more. They packed them into plastic sacks and tied a knot in the sack once they finished putting gone of each item into the bag. When the club finished, they packed 200 sacks in just under an hour. The members of the club felt good about helping other kids in need in their own town. The Nebraska 4-H Foundation and Nebraska 4-H Ambassadors are proud to call the Lucky Clovers 4-H Club of the Month for September 2013. The Nebraska 4-H Ambassadors together with the Nebraska 4-H Foundation provide the 4-H Club of the Month program to all Nebraska 4-H clubs throughout the state. Clubs can nominate themselves by telling why their club should be chosen as Club of the Month. A different club will be chosen each month and will be awarded with a certificate and $50 cash card. 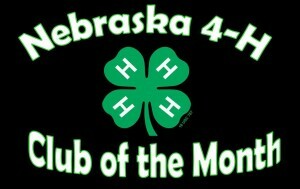 For more information go to the Nebraska 4-H Foundation website at http://www.ne4hfoundation.org/events/4-h-club-of-the-month or e-mail ne4hambassadors@unl.edu. No Comments to "The Lucky Clovers – September 2013 Club of the Month"